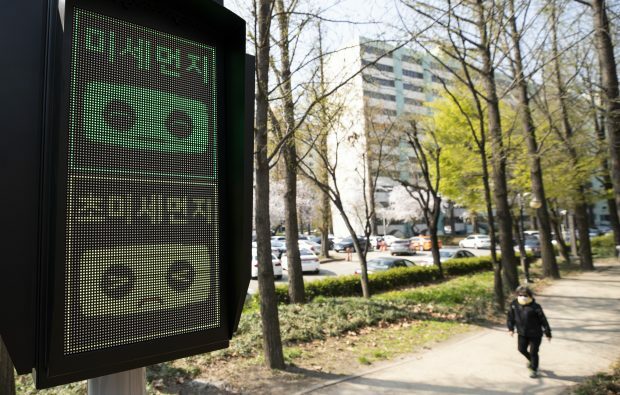 The government of Seoul said Thursday it will install signal lights to display levels of fine dust air pollution at all riverside parks in the capital to caution citizens against health hazards. A total of 12 fine dust signal lamps will be installed at major entrances to all of the 11 public parks in Seoul along the Han River, by Friday, the municipal government said. The 11 public riverside parks include those in the Yeouido, Ttukseom, Jamsil and Mangwon areas, it noted. The fine dust signal lamps, donated by Hyundai Marine & Fire Insurance Co., display the density of fine dust concentrations on LED display panels in four colors. A red light indicates very bad dust pollution, or a fine dust level (PM 10) above 151 micrograms per cubic meter and an ultra-fine dust (PM 2.5) level above 76 micrograms per cubic meter. PM 2.5 refers to a level of particles smaller than 2.5 micrometers in diameter, while PM 10 stands for particles smaller than 10 micrometers. Yellow means bad, or a PM 10 level between 81 and 150 micrograms and a PM 2.5 level between 36 and 75 micrograms. Green means normal condition or a PM 10 level between 31 and 80 micrograms and a PM 2.5 level between 16 and 35 micrograms. Blue indicates very good condition, or a PM 10 reading below 30 micrograms, and a PM 2.5 level below 15 micrograms. The signal lights will be updated every hour with numerical information sent from the nearest of 50 air quality monitoring stations throughout Seoul via LTE communication networks. The municipal government said it will also install fine dust signal lamps in other public parks in the capital. According to government data, the average concentration of PM 2.5 particles in the air of Seoul reached 44.6 micrograms per cubic meter in March, the highest level since record-keeping began in 2015. In early March, the daily average of PM 2.5 surged close to 150 micrograms per cubic meter in Seoul.